Flexibility exercises for seniors are used to become and stay healthier, stronger, and more active. 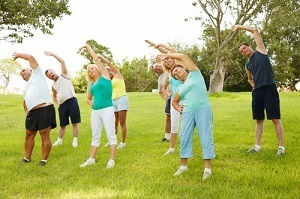 Furthermore, flexibility exercises for seniors are important in preventing injuries, back pain, and balance problems. Finally, flexibility exercises for seniors are doable around the house. In addition, general information about exercises for seniors is available elsewhere. Also, other types of exercises, such as strength exercises, balance exercises and, aerobic exercises, are available to seniors. Most of all, always include a 5 to 10 minute warm up before you start. Doing light exercises such as walking in place and arm circles, gets your muscles and joints warm before stretching. The neck side stretch is one of the flexibility exercises for seniors. And, it will loosen any tension in your neck and the tops of your shoulders from sleeping in the wrong position for too long. Also, it will loosen any tension in your neck and tops of your shoulders from sleeping without enough pillow cushions at night. First of all, start by sitting tall in a chair. Next, to warm up your neck, gently lean your head to one side, then the other side. Now lift your right arm up and over your head, resting your palm gently on the left side. Next, gently pull your head to the right (very gently – in fact just placing your hand there may be enough weight to cause you to feel the stretch). Finally, hold for 20 to 30 seconds, then repeat on the other side. The Shoulder and Upper Back Stretch is one of the flexibility exercises for seniors. And it will help loosen muscles causing your shoulders and upper back round forward and improve spinal flexibility, so you can stand straight again. First of all, begin by standing tall, arms by your sides. Next, reaching behind you with both hands, pull your shoulders back and clasp your fingers together. Now, if you feel a stretch already, hold it here. Also, if you can go further, push your clasped hands away from your lower back and gently arc backward. Finally, return to standing tall, and repeat. The Triceps Stretch is also one of the flexibility exercises for seniors. Also it can be done either standing or sitting, and is great for improving flexibility and mobility in the arms and upper back. First of all, start by sitting tall in a chair (or standing), lift your right arm up over head, bending at your elbow. Next, reach your opposite arm up to clasp your elbow, and pull gently in the opposite direction. In addition, you should feel a light stretch through the back of your arm. Finally, hold for 20 to 30 seconds, then switch arms. The Back Stretch is one of the flexibility exercises for seniors. Furthermore, it is great for gaining greater mobility in your spine, and can even help with rounded shoulders. It’s also slightly dynamic, which will get your blood flowing. First of all, start by standing tall, with your hands on your hips. Next, gently arc backward, looking up toward the ceiling. Now, hold for about three seconds, then return to standing. The Standing Quadriceps Stretch is one of the flexibility exercises for seniors. And, this exercise is excellent for lengthening the quadriceps muscle that sits at the front of your thigh. This area can often become shortened and tight from sitting or hunching forward, which can lead to pain and a worsening of bad posture. First of all, start by standing tall, holding onto the back of a chair or countertop with your free hand for balance. Then, slowly bend your right knee and grasp your foot. Now, at this point, you might already feel a stretch through the front of your thigh. 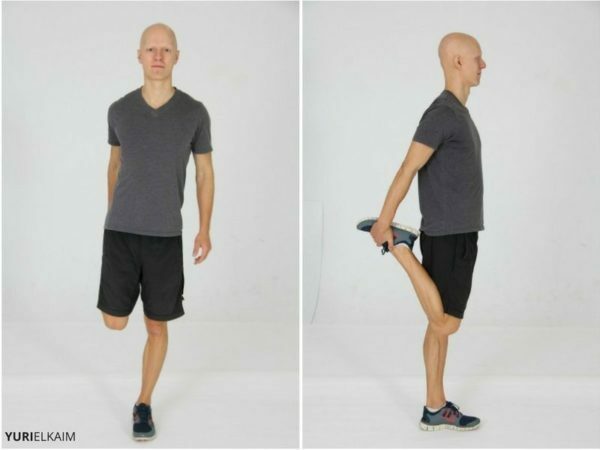 Finally, hold this stretch for 30 seconds, then repeat on the other leg. Also, if you’re having trouble reaching your foot with your hand, try using a yoga strap or band, as mentioned above. Stiff and/or weak ankles spell bad news when it comes to maintaining your balance. Ankle Circles is one of the flexibility exercises for seniors. Furthermore, this exercise gives you greater flexibility, and helps you create a first line of defense against falls and stumbles. First of all, get comfortable in a sturdy chair, sitting up tall. Next, extend your right leg out in front of you, keeping the other on the floor. 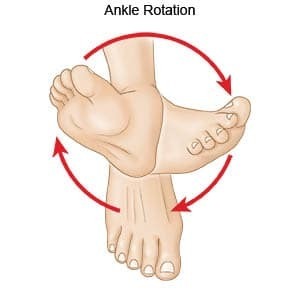 Now, begin to rotate your right ankle; 10 to 20 rotations clockwise and 10 to 20 counter-clockwise. Finally, lower your leg and repeat on your opposite leg. The Seated Hip Stretch is one of the flexibility exercises for seniors. Also this exercise helps increase the flexibility in your hips, allowing you greater range of motion. First of all, begin by sitting tall in a sturdy chair. Next, cross your right leg over your left, letting the right ankle sit atop your left knee. Now, relax your right hip, letting gravity pull it toward the floor. You may already feel a stretch deep in your hip. To go further, gently press down on your right leg and the knee for a deeper stretch. Finally, hold for 20 to 30 seconds, then switch legs. The Cat-Cow Pose is one of the flexibility exercises for seniors. Also. this exercise is actually a dynamic yoga stretch, great for increasing mobility and flexibility in the spine. First of all, begin on the floor on all fours. Also, make sure your hands are directly beneath your shoulders and your knees are directly beneath your hips. And, use extra padding (small pillows, towels, etc.) if your knees are sensitive. Next, once you’re in position, inhale, arching your spine and lifting your head and chest toward the ceiling. And, hold for a breath. Now exhale while pulling in your stomach and dropping your head and neck down (think like a startled Halloween cat). Finally, repeat this movement as many times as you like, but do a minimum of 10 to 15 repetitions. The gentle Hamstring and Low Back Stretch is one of the flexibility exercises for seniors that targets the lower back and hamstrings. Furthermore, the lower back and hamstrings can become tight or painful due to prolonged sitting and/or poor posture. First of all, come into this stretch by lying face-up on your bed or floor. Next, bend your right leg and slowly move it toward your chest. Also, keep your shoulders flat on the floor as you reach your arms around your right knee (if you can’t reach that far, try holding your pant leg) and pull it toward you. Now, you should feel a slight stretch through your low back, glutes, and hamstring as you hold for 30 seconds. Finally, repeat on you opposite leg. First of all, sit with your feet flat on the floor, shoulder-width apart. And, keep your hands relaxed at your sides. Next, don’t tip your head forward or backward as you turn your head slowly to the right. And, stop when you feel a slight stretch. Now, hold for 10 to 30 seconds. Next turn to the left. And, hold for 10 to 30 seconds. Finally, repeat 3 to 5 times. First of all, sit in a firm chair. And, place your feet flat on the floor, shoulder-width apart. Next, hold your arms up and out in front at shoulder height, with your palms facing outward and the backs of your hands pressed together. Also, relax your shoulders so they’re not scrunched up near your ears. In addition, reach your fingertips out until you feel a stretch. Consequently, your back will move away from the back of the chair. Now, stop and hold for 10 to 30 seconds. First of all, stand with your feet hip-width apart and your weight evenly distributed on both feet. Also, relax your hands at your sides. You can also do this exercise with a sturdy chair in front of you in case you need to grab it for balance. Next, shift your weight on to your right side, then lift your left foot a few inches off of the floor. Now, hold for 10 seconds, eventually working up to 30 seconds. Next, return to the starting position and repeat with the opposite leg. Yoga is one of the flexibility exercises for seniors. Furthermore, as you age gracefully, it's important for you to continue to strengthen your bones, muscles and also work on your balance. In conclusion, flexibility exercises for seniors are important in preventing injuries, back pain, and balance problems.